Born from founder Paul Beebee’s garden shed, Beehive has been creating illustrations for worldwide clients for almost 30 years. In 1986, fresh from an HND in Technical Illustration, Paul took up a place as an in-house illustrator in Malmesbury. Realising there was enough work to keep his illustrator friends busy as well as himself, Paul set up Beehive Illustration in 1989 in Cirencester, and since then it has grown into an agency representing over 160 illustrators globally. We’re a small and friendly team, and we all work really closely together, pitching in to help each other wherever needed! Paul is the Managing Director and makes sure everyone stays happy in the Hive. As office manager, Ellie has a handle on the day-to-day running and is always on hand to solve a problem, as well as looking at all the new illustrator submissions and managing our social media channels. Christina is the project manager, and the first point of contact for new enquiries – she’s the one handling the all-important briefs and fees, and making sure our illustrators are happy as they begin their commissions. Rhiannon oversees the running of ongoing projects, liaising with clients and illustrators and keeping tabs on deadlines and feedback to see projects through to final artwork stage. Abi looks after all illustrator contracts, as well Honey Points and all the other gift schemes for our clients, updates our social media – and does the Post Office dash! Louise is our financial guru, overseeing all the accounts and making sure everything adds up. Katie uses her marketing know-how to devise new strategies to best promote our wonderful artists. Overwhelmingly yellow! We’re truly committed to the bee theme. Our office is in the Cotswold market town of Cirencester, Gloucestershire, right in the middle of town. We’re at the top of our corner building, so we have a great vantage point for observing all the goings-on in Cirencester. Once we even spotted Princess Anne out of the window! Radio on, heaters on (that applies for most of the year – being an old building, it can get a little chilly)! Our day revolves around keeping up with all incoming emails – and the tea rota, of course. We try to ensure all our enquiries receive prompt replies, and that our illustrators’ projects are kept moving as smoothly as possible with our bespoke tracking system. We might pause for an informal team meeting and have a nibble on the copious amounts of chocolate we keep here for our clients. All in the name of quality control, of course. Being such a small team, we feel like we’re able to have a really personal relationship with artists and clients alike. With all the talent we have on offer, we can turn our hand to anything, and we never shy away from a challenge! Knowing our illustrators’ individual skills inside and out is really important in order to ensure we’re always helping them work to the best of their ability and meet their personal goals. As a rep, it’s crucial to understand how current illustration trends are evolving, and we try to encourage our artists to be active participants in the illustration community so they get a sense of this, too. On a practical level, it’s important to be super-organised – it’s a fast-paced industry! The internet has had a huge impact on the day-to-day role of a rep. Gone are the days of packing up and sending final artwork to clients through the post; everything is done through email, making turnaround times much faster. As reps, our online presence also means we also have a worldwide reach to potential new clients. It’s a bit of a cliché, but a “wow” factor really does help you to stand out in the crowd. There’s a lot of competition in the field of illustration these days, so a carefully curated portfolio is the most important tool for getting noticed. 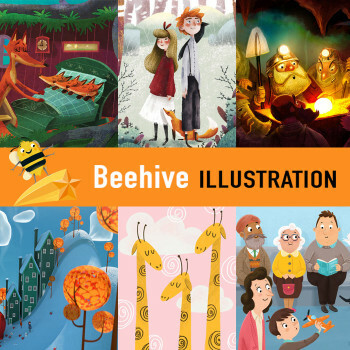 We look for illustrators who are aware of the current trends and ‘switched on’ to the market. A strong and original style is often eye-catching, but equally an ability to be versatile can be extremely valuable. Communication is key! Keeping in touch with us to let us know availability, asking questions when anything isn’t clear, and updating us on progress with ongoing projects makes everything run more smoothly. Being mindful of deadlines and closely following instructions from clients is also really important, and can keep clients coming back to commission projects with someone they know they can trust to do a great job. Doing your research is vital to ensure you find an agency that’s a good fit for your work. Do you want to illustrate for picture books, get into the editorial art sector, or work on technical diagrams for STEM industry publishing? Some agencies work on a broad range of projects, and other specialise in a particular field; it’s important to know where your style fits best in order to get the best out of an agency. Take a look at the other artists on an agency’s books, and see if it’s aimed at the market you’re interested in. When you submit your portfolio, make sure it’s the best it can be. It’s tempting to show everything you’ve ever done, but make sure that each piece is really something you’re proud of and shows you off to the best of your abilities. Add a little background about yourself, too – we’re a nosy bunch! Our access to the industry is a huge benefit for illustrators, whether they’re just starting out and hoping to break into illustration, or if they’re already established and seeking new markets for their work. On a practical level, we try to take some of the hassle out of the more time-consuming admin tasks for our artists, such as handling contracts and payments, so that we can free up their time for the important stuff: working on live projects and developing their portfolios! We love the variety, and we hope our illustrators do too! We can go from working on a brand new pre-teen fiction series from a debut author, to reimagining a classic fairytale, to illustrating a whole ELT workbook – and we know our illustrators will always come up with something brilliant. It’s always exciting when something a little more unusual comes along, too, like when one of our artists gets the chance to illustrate at an event and interact with people for whom ‘live’ art might not be an everyday sight! We’d say that you don’t have to be young to become an illustrator! It’s something that you can do at any stage of life, if you’re passionate about it. Formal education in illustration is great, but it’s just a stepping-stone, and having the raw talent to develop is just as important. It’s always useful to have an understanding of the other fields surrounding your role as an illustrator, such as design, and general publishing processes. Most of all, get your work out there in any way you can! As well as an online portfolio, social media is a powerful tool for getting noticed, and feeling part of a community of other artists can really inspire you and push you to be the best you can. Whether it’s on your own personal website or an agency’s, your portfolio is the most important tool for promoting your work well, so spend some time thinking carefully about the content and presentation. Create a cohesive and consistent showcase of your talent – as mentioned, it’s tempting to add every artwork you’ve ever done, but selecting the very best pieces is a better way of showing the quality you can achieve. If you have a whole range of styles, try grouping them together for maximum impact and to ensure that a potential client is clearly able to see your skills range. If you have one signature style, try to show a range of subject matter, so potential clients know that you can adapt your skills to different types of projects – and most importantly, theirs! Making sure that our artists are treated fairly, especially in an increasingly demanding market, is a big challenge in the industry today. Keeping up with ever-changing trends and ensuring that we (and our artists) can evolve with the market is something we’re continuously working on. And, importantly, looking out for the wellbeing of our artists – ensuring that they have a good work/life balance, and continue to find enjoyment in their chosen career! Here's a selection of some of our favourite recent book projects. It's always a thrill to see the finished product, and we're very proud to show them off!